As more smart devices are added to home and business networks, an easy-to-use platform to manage these devices and keep information secure is imperative. Introducing CableLabs Micronets, a next-generation on-premises network management system providing enterprise-level security that’s highly adaptive and effortless. No matter how complex the network, Micronets has it covered. Our latest innovation, Micronets, is built on well-established Software Defined Networking (SDN) technologies that leverage device fingerprinting and dynamic identity techniques (e.g., PKI certificates) to automatically organize all network-connected devices into separate trust domains, or micronets, and manage the connectivity between them. The Micronets platform allows for easy onboarding of new devices with minimal know-how, giving users the security and control they want without the hassle. Micronets also gives authorized companies the tools they need to easily identify connected devices and isolate issues so that they can provide better support for their customers. SDN establishes the foundation for a new security experience through three basic capabilities: network segmentation, secure network extension and advanced security services. The Micronets platform redesigns home and business networks into multiple dynamically managed networks or micronets. By organizing all the networked devices into multiple micronets, the system can effectively isolate any security threats and prevent them from damaging the entire network. For example, if a baby monitor gets hacked because of an unsecure port, the attackers will not be able to get easy access to the devices in other Micronets, such as a home security system or family computer. The future of IoT is moving toward a plethora of personal sensors, actuators and processors that maintain constant connection to a third party. For example, there are glucose testers that send results to a family doctor or a hospital for round-the-clock monitoring. Micronets provides application interfaces to trusted third parties that simplifies and protects the device and user. Once the customer takes the device home, it automatically joins his or her home network (with permission, of course) and securely connects to the third-party provider. Security threats continuously evolve as new vulnerabilities and new hacking tools are discovered. A security solution that worked last year might not be as effective today. By leveraging adaptable security technologies, such as device fingerprinting, artificial intelligence (AI), machine learning–based anomaly detection, Micronets protects the user’s network by isolating compromised devices. Micronets also leverages stronger device credentials to ensure that devices are authenticated as and when they connect to the network. Micronets is just one part of CableLabs' larger effort to advance cybersecurity measures across the industry. To fully address the constantly evolving threats to our networks, we are taking a multifaceted approach comprised of mitigation and prevention tactics. On the mitigation side, we are working on advancing compromised-device detection, DDoS monitoring, IP-address spoofing prevention and other cable-based technologies. On the prevention side, we're actively contributing our device security expertise to Open Connectivity Foundation (OCF), an industry-wide effort to develop an open IoT specification standard, and open-source initiatives like IoTivity. Don't have an account? Click here to see if you're eligible. There are many different ecosystems and few consistent standards for the various kinds of devices and services being used in homes and businesses today. We realized that a platform was needed that evolves the traditional consumer and business gateway into an advanced and agile system that contains security breaches and provides adaptive security measures as threats evolve. The Micronets platform redesigns a home network into multiple dynamically managed networks or micronets. Each micronet is a trust domain that asserts rules on how devices interconnect and access the internet. Furthermore, Micronets leverages a cloud-based micro-services architecture that integrates intelligent services such as artificial intelligence (AI) based device fingerprinting and IoT security. It also allows straightforward onboarding of new devices as they are added to the network. How does Micronets benefit consumers? A core pillar of the Micronets platform is ease of use for consumers and business owners. It allows them to connect the devices of their choice and helps them organize and manage their devices with built-in security capabilities. This results in a dynamic and self-organizing system. Furthermore, the Micronets platform leverages APIs to allow machine learning and neural network technologies to dynamically deliver advanced security features where necessary, all while giving the customer complete control. 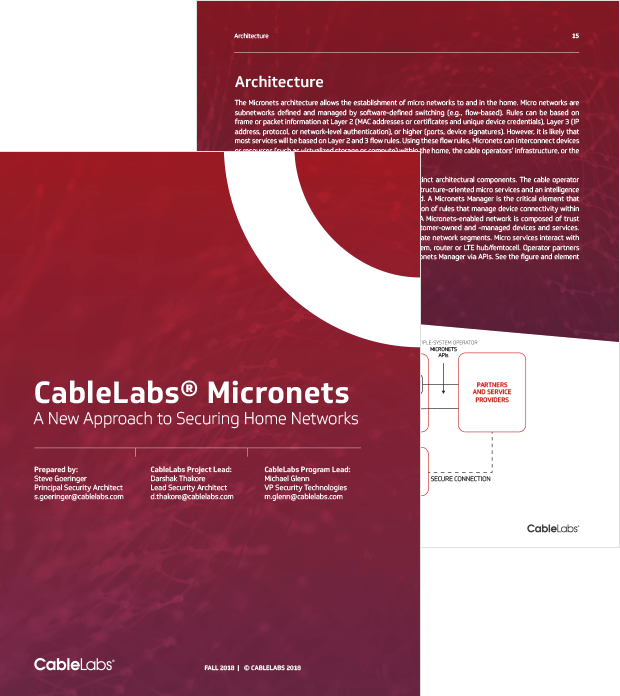 How is CableLabs and the industry cooperating to develop and deploy Micronets? CableLabs is driving the effort to advance cable-based security technologies and create better Internet of Things (IoT) standards across the industry. We’re working with our industry partners and members to bring this technology to the customers. We’re also actively contributing to various standards organizations, such as Wi-Fi Alliance and the Internet Engineering Task Force (IETF), while also supporting government efforts under the National Cybersecurity Center of Excellence (NCCoE) to accelerate the adoption of this technology. White Paper: This white paper lays out the vision and architecture of Micronets in greater detail. Our Members and Vendors: We are developing and publishing specifications for standardized APIs for advanced security services based on machine learning and device fingerprinting in collaboration with our members and vendors. Where can I find Micronets resources? Read the detailed technical documentation and check out the source code regarding the Micronets platform. Work with us on implementation by contacting Darshak Thakore at d.thakore@cablelabs.com. For more information, contact us at info@cablelabs.com.